Last week, I spent some time at Advertising Week New York. A fantastic annual event, sessions included content on Data, Storytelling, Leadership, Creativity, AI & Cognitive Computing, Evolution of Video, and more. Here is a quick rundown of the takeaways from a few of the sessions I attended. 2017 is the year for the “reintroduction” of video. There are so many options for video. Video should be used to Communicate, Inform and Help. For example, video has changed the way disasters are reported and enabled people to help communities affected. Take, for example, the recent Hurricanes – Harvey, Irma, and Maria. Collectively, they have left entire countries devastated. The Cajun Navy used Facebook Live to inform people of where they are heading, to let them know help is on the way. The Dodo channel used video to report on animal rescues. Consumers have already shifted to mobile. Now, they are shifting to mobile video. In 3 years, 75% of all mobile data traffic will be video. Video is so popular because it shows real people running the show, helps build communities, and proves that one size does not fit all. Sight, sound and motion are an essential part of how people connect. Instagram proves this. It’s platform allows the formation of communities around a passion. Now a platform that boasts 800 million user – video being the key driver of this growth. Marketers need to jump on this trend. Content starts with the consumer at the center – if they favor video, so should you. With great power comes great responsibility. Google and Facebook are media companies with great burdens. The world is changing. Digital has empowered the everyday individual to take ownership. Brand has never been more important. Wired CMOs with Maya Draisin, CMO, Wired, Melissa Barnes, Head of Global Brands, Twitter, Pamela Drucker Mann, CMO, Conde Nast, David Fischer, VP, Business & Marketing Partnerships, Allie Kline, CMO, Oath and Dan Levi, CMO , Clear Channel. This fantastic panel bought together key advertising and marketing leaders to discuss how technology is impacting our world. For some, success is fortifying what you have. What’s worked. But, with the speed in which consumer behavior is changing, companies need to move from a transactional, “now” mindset to one of innovation. A key trend in the discussion was the need to embrace failure. Not everything works. Creating an environment for change, means creating an environment where failure is ok. Leading the change means tolerating the risk. It’s also important to assess who will need help balancing the changes, and where, if necessary you need new people. Stepping back and taking a step to ensure the teams and individuals are behind it. Making them feel safe. Comfortable with the uncomfortable. Unity of the team is critically important. Briefly, the need for experiential marketing was also discussed. Really good storytelling happens, but its important to remember that you can’t skip experiences. In another session, The Experience Economy moderated by PWC. Here a collection of CMOs came together to discuss how to create fans for your business. I loved the example of Tough Mudder whose Legionnaires act almost like business owners. They have an emotional connection to the brand, and are not afraid to voice their opinions. Creating an emotional connection, a lasting memory, both in real life and on digital, is vital to the creation of fans. Thought Mudder does this by creating community content for across the customer journey, be it at the training stage, during the race itself, or after the race has concluded. Unified stories across all channels is also key to success. 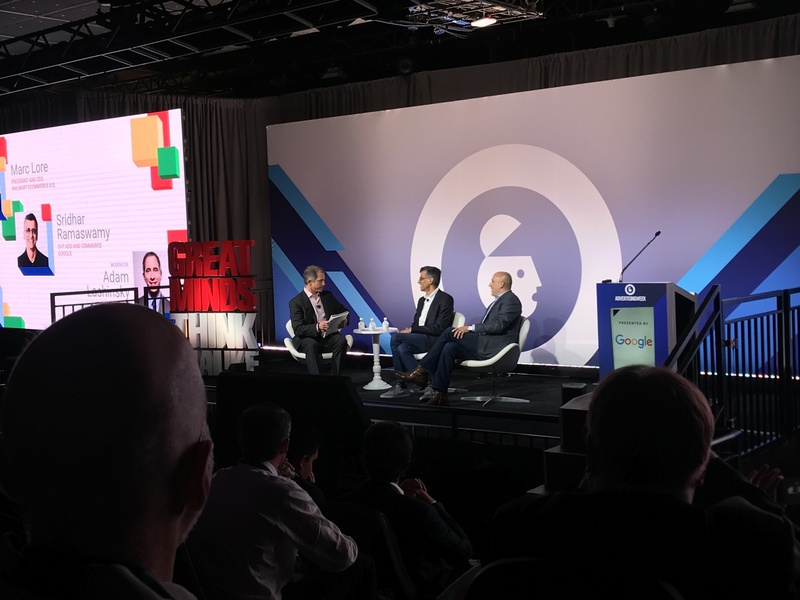 The Future of Commerce with Marc Lore, President & CEO, Walmart ECommerce, Sridhar Ramaswamy, SVP Ads & Commerce, Google, moderated by Adam Lashinsky, Executive Editor, Fortune. Personalized shopping is the future of commerce. Be it in store, online, in your car – the connected consumer looks for convenience and trust. Consumer trust is hugely important. Privacy is extremely important to the consumer. They require the ability to opt-in, or out. Keeping data safe is a priority. Walmart is innovating, catching up with and now outpacing Amazon in a lot of ways. Voice is coming. Voice enabled by artificial intelligence. Voice is retail of the future. We went from store to unlimited online options. Voice requires one best answer. Filters are not readily available. Recommendations have to be spot on. Precise personalization is a necessity. Google’s vision for personalization is not limited to just commerce. The mobile world and the assistant world – logged with experiences. We are learning how to use machine learning and AI. The future is about helping the consumer with their own preferences. Advertisers are looking for ways to influence/ change preferences. After voice – Virtual Reality comes next.